One of the things we talk about a lot on this site is the absolute necessity of having clean drinking water readily available. This can be a slow and demanding process when you’re treating water for more than just yourself. You need a purifying filter that works quickly, reliably and most of all EFFECTIVELY. That’ll keep your group moving, hydrated and (as a result) alive. So let’s take a look at the best water purifier for groups that the world has to offer. When you need to quickly filter out viruses, bacteria, chemicals, cysts or protozoa, the XLE Elite is the horse you want to place all of your bets on. It has a .4 micron self-cleaning filtration system that meets EPA standards for purification without any added chemicals. Another cool feature is that the XLE Elite has a sealed compartment that traps and contains any collected waterborne cysts and prevents the user from being exposed during filter changes. Another great feature of the XLE Elite is that it will remove pesticides and organic phosphates from filtered water. That means you can obtain water from just about any source with total confidence in your purification system. 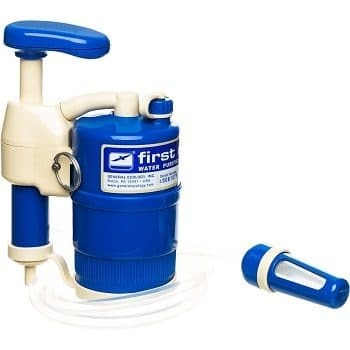 The easy to use pumping systems cranks out 2 Liters per minute and has a 680 Liter capacity. This is a long lasting, quick working, effective piece of water treating technology. It weighs in at just about 1lb so carrying it won’t wear you out. If you’re plan is to form a group and survive the zombie apocalypse together, get yourselves a couple of the XLE Elite Purifiers and you won’t have to worry about where your next drink is coming from. PS- Don’t forget replacement filters!